If you're just starting out and have smaller studio monitors that you'd like to set on stands, the JS-MS70 is the perfect solution for you! The stable low-profile base can easily be positioned into tight spaces. The Aperta Isoltation Support Plate can be affixed to any supporting surface to provide a larger surface area for the Aperta stands. 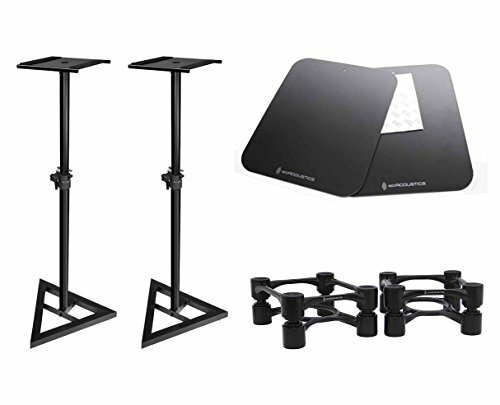 These plates can be used to expands the top base of your speaker/monitor stands or to accommodate the IsoAcoustics Aperta stands. Double-sided tape is provided to fasten the Aperta Support Plate to the supporting material, or the plates can be drilled and bolted into place. Care should be taken to ensure the supporting structure is stable enough to support the stands and speakers. Aperta, the stylish and sleek new line of sculpted aluminum acoustic isolation stands designed for medium-sized professional studio monitors and speakers. Aperta, the Italian word for “open,” describes the stands’ stylized design that creates open space and compliments its surroundings, as well as the spatial openness in sound and the crystal clarity in music that they deliver. The artistically designed Aperta stands raise the bar to set a new standard for remarkable acoustic isolation and performance.